82 / the tasting panel / april 2015 by Brian Kustera / photos by Cal Bingham T he story at Giardino is simple: good, authentic food made by good, authentic people. The space—while it may not look like much from the outside—is beautifully understated and genuinely romantic. Walking through the front doors immediately transports guests to the green hillsides of Central Italy, and just like the finest eateries in the Marche region (Le Marche), Giardino's true gifts—fresh cuisine and heart- warming atmosphere—are well worth the trip to this eatery in the affluent Los Angeles suburb of Westlake Village. "The concept of this restaurant is basically a trattoria, a casual environment that focuses on the food, recreating what you can find in our home region. Nothing too pretentious—if that's a word or if I just made it up, I don't know," laughs co-owner Matteo Carletti, poking fun at his still-expanding English vocabulary. 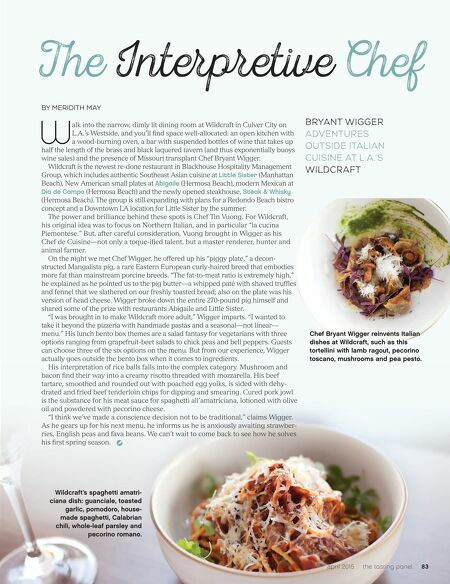 He continues, "Using organic, local products, whether it's the chicken, white fish or filet mignon, everything is top quality, and we focus on keeping the food and dishes honest." Chef Francesco Pesce, also from Le Marche, brings both traditional Italian dishes and cutting-edge specialties to the plate at Giardino. Among Giardino's best-selling appetizers is a traditional Italian dish called vitello ton- nato—chilled roasted veal loin, tuna and anchovy aioli, caper berries—mak- ing its way onto the menu as one of Carletti's favorites from his youth, while the one-of-a-kind ricotta dumplings are a delicious Chef Francesco exclusive. While almost all of the pastas and desserts are made in-house, Giardino's dedication to authenticity has led to the importing of one Italian product that's been around since the Medieval times: Campofilone pasta— a brand available in California exclusively at Giardino. "We like to support the Marche region. The products we use are not used anywhere else, and the quality is superior. It makes me very proud," smiles co-owner Giorgio Pierangeli as Carletti brings out the seppia al guazzetto, a traditional stew from Le Marche made from cuttlefish overnighted from Europe, attesting yet again to Giardino's honest and fresh food. "We may be many miles away from home here in Westlake, but as far as food and the overall experience, it's just like being in Le Marche, enjoying a delicious meal with close friends," continues Carletti, as our afternoon visit ended with happy, full bellies and so many more reasons to return— two new friends from Central Italy being our favorite among them. K N O R T W X B I L On Your Marche, Get Set, Giardino! GIARDINO RESTAURANT AND OWNERS MATTEO CARLETTI AND GIORGIO PIERANGELI INTRODUCE WESTLAKE VILLAGE, CA TO AUTHENTIC ITALIAN CUISINE Vitello tonnato—chilled roasted veal loin, tuna and anchovy aioli, caper berries—made its way onto the menu as one of Matteo Carletti's favorite dishes from his youth in Le Marche. Linguine al nero— black ink linguine, mixed seafood and cherry tomatoes—a dish prepared with Italy's signature Campofilone pasta. 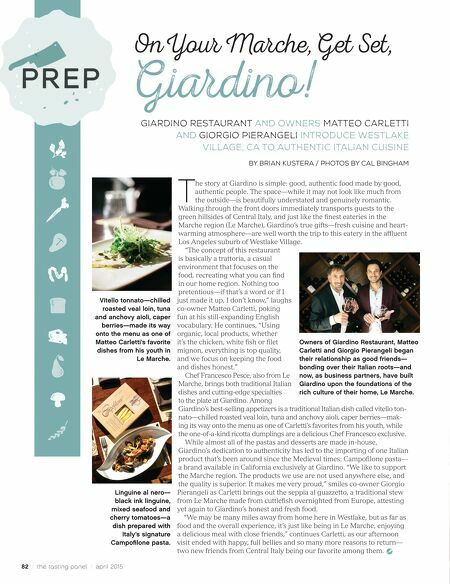 Owners of Giardino Restaurant, Matteo Carletti and Giorgio Pierangeli began their relationship as good friends— bonding over their Italian roots—and now, as business partners, have built Giardino upon the foundations of the rich culture of their home, Le Marche.